This post has been a long time in coming. Since 2008, like many of you, I’ve witnessed the conversations about the future of theological education online, in print, and in person…and specifically, have seen a lot of recent talk about the three Protestant seminaries of the Twin Cities (esp. on FB). Much of the discussion is doomsday, and I’ve wanted to counter it because I think it’s misguided (and maddening), but I haven’t taken the time. My reticence to say something changed the moment I read Tony Jones’s 9/9 post on Patheos, entitled “A Tale of Three Seminaries” … and so I decided it was time to speak up. I’m joining this conversation because I love Luther, Bethel, and United. I am a M.Div. graduate from Bethel Seminary (2011), and during my time there I took three classes at United Theological Seminary. Additionally, I worked in admissions at Bethel Seminary from 2005-2011 and then I moved to Luther Seminary and led their admissions team from 2011 until 2013 when I left to pursue my Ph.D. at Loyola University. I have friends, mentors, and colleagues at all three schools. Additionally, I am getting my Ph.D. because I am interested in being part of the future of leadership in theological education. If you haven’t yet read the article on Patheos, then I’ll summarize it briefly. Tony begins by stating that he thinks that the story of the three Protestant seminaries in the Twin Cities can teach us something about the church in America. The lesson (*spoiler alert), we can learn from these three schools, according to Jones, is that the evangelical seminary is “waning” and the liberal seminary is “waxing” (I’m still not really sure where Luther fits, I’m assuming that from Jones’ perspective it’s more conservative/traditional). The rise of enrollment at United and the fall of enrollment at Bethel and Luther is provisional proof (the whole piece assumes his conclusion is correct, but he phrases it in question format) that “the conservative moment has passed” and that “progressive Christianity” is marketable. If we are going to talk about the future of theological education and of the church…then let’s be honest about numbers. If we are going to talk about the future of theological education and of the church…then let’s take a long-view of history and engage in critical reflection instead of being provocative. If we are going to talk about the future of theological education and of the church…then let’s strive to fight against a scarcity mentality and/or a “winner takes all” perspective…this is not market capitalism (or is it? ), it’s the church. If we are going to talk about the future of theological education and of the church…then let’s be irenic and hope for the well-being of the church and of theological education in its many forms. These are the four principles that I’m both interested in following as we have this dialogue, and four of the reasons that I take issue with both the content and the tone of Jones’ piece. I’ll now spend some time addressing the particularities of my critique. My first issue is that he doesn’t take a long-view…rather, he picks elements that support his claim that conservative Christianity has seen its day. Indeed, these are serious times in theological education and in the church. The mid-2000s saw the peak enrollment for theological education across the Association of Theological Schools (ATS—Note: some institutions have still grown since this time, but it has largely been in start-ups like Seattle School of Theology and Psychology or distance-heavy or distance-only programs like Indiana Wesleyan or Liberty). From the 1980s up until about 2008, seminaries were built around either dramatic increases in enrollment (fueled in large part by the influx of persons pursuing adult education, and the other growth trends in higher education) or upon some combination of growth / endowment reliance / maintenance of enrollment. Since 2008, our financial market experienced recession and theological education, which was built upon expected continual growth of market share, has largely flat lined and/or decreased. Summary- While there has been an 18% decline in theological education in the past 10 years, if we take a longer view, we can see that in actuality ATS schools as a whole experienced overall GROWTH of 3.5% over 20 years. During this time some schools lost enrollment, but some grew…and overall it’s not nearly as bleak enrollment-wise as people think. Granted, there are HUGE issues facing theological education such as: evaporation of financial backing from church bodies, continued increases in the costs of health coverage for staff and employees, student debt, vocational possibilities are uncertain, new delivery formats and changes in accreditation requirements, etc. But let’s take a long view of theological education…it will continue to re-birth itself (as it should! ), and even if this looks different in some ways than we had imagined…then so be it. Either way, I take a perspective of hope and goodwill for all of theological education and believe that it is a gift for the church. Having situated some of the conversation regarding the state of theological education, I will turn to Jones’ claims regarding the three Protestant seminaries in the Twin Cities, and then I will offer my responses. Jones spends some time situating the schools: Luther is the largest of the ELCA Seminaries; Bethel is a BGC seminary (now, Converge Worldwide) and broadly evangelical (he doesn’t say this, so I am clarifying); and United is a historic UCC seminary and a space for liberal theology. While introducing the schools Jones begins to paint the picture he wants us to see, namely that the progressive seminary (United) is flourishing, and that the Lutheran and conservative seminary (Bethel) are struggling. He makes his case by talking about all of the good things that are happening at United (they reduced the size of their M.Div., added new community classes on beer making and bee keeping). And by contrast, he states that Luther is “bleeding with lay-offs” and Bethel has “tracked hard to the theological right” and lost faculty and an admissions person to United. They are all the same enrollment, Jones tells us. For the first time ever…amazing! I mean…if this is TRUE then his conclusion is obvious. This means that something good is happening at United over-against the other two schools. How exactly does he get it wrong? Here’s my commentary according to school. Luther Seminary: Luther is the largest of the eight seminaries of the ELCA denomination. Jones notes that they used to have incoming classes of well over 100, but “due to falling enrollment and financial mismanagement, the president and CFO were let go and many faculty and staff were laid off.” He also claims that they are “bleeding with lay-offs” and have experienced the “cancellation of some degrees.” On a positive note, he acknowledges that morale has improved with the arrival of Luther’s new president, Dr. Robin J. Steinke. He ignores their long-standing commitment to community education and conferences, etc. Luther is one of the largest stand-alone seminaries in the country and is the flagship school of the ELCA. It has maintained a fluctuating enrollment over the years (from 1993-2005 it’s headcount varied but it ended with a net gain of 0%; it then declined by 7.7% between 2005-2012—so it neither saw the huge increases nor as large of declines as the ATS overall). In 2012 there were 120 new M.A./M.Div. students; in 2013 there were somewhere between 105-110 new M.A./M.Div. ; in 2014 they will have about 100 new M.A./M.Div. over the course of the year (Note: their numbers always included the whole academic year, and right now we only know their summer and fall stats). All told, they will have over 120 new students this fall when you include non-degree, certificates, and M.Th. students (excluding D.Min.). The reason for Luther’s financial “crisis” is that they were continually overspending the budget. This hadn’t historically been a real problem because they kept receiving more grants and monies (it’s more complicated than that, but this will suffice). The tough decisions made by the board and leadership of Luther were made in order to ensure that Luther has a strong future for generations to come. For instance, until 2012, when compared with other seminaries of the same size, Luther had a faculty to student ratio of 1 to 8 with a total of 45 faculty members; the average ratio for similarly sized schools is 1 to 18! As for “canceled programs”: The Ph.D. program was put on hold in order to ensure that they could make it financially sustainable (by the way- it’s the only of the three seminaries in the Twin Cities that had a Ph.D. program—one where Luther covered all tuition AND pays students a yearly stipend!). This being said, Luther is a strong institution that has a new curriculum and a new President along with very strong backing from within (its board) and without (it has amazing support from donors, etc. )…along with a lot of amazing students and innovative programs and opportunities both for students, ministry leaders and community members such as the Working Preacher, Center for Stewardship Leaders, God Pause, Kairos Continuing Education, the Lay School of Theology, Celebration of Biblical Preaching, an amazing art collection, etc. As for where he gets the number 60? I’m baffled. Luther has historically welcomed more than 100 new students every year, and while their numbers are down, they are not anywhere near the numbers that Jones suggests. The only thing that I can figure is that Jones is claiming that there were historically 100+ M.Div. students and now there are only 60…well, if this is his argument then I would counter him by noting that any account of new M.Div. included students from the entire year who enrolled in the MDiv (along with “Lutheran Year” folks), and while over time Luther has seen less M.Div. students enroll, it has experienced gains in its M.A. programs in the past 10+ years that have aided their total enrollment numbers. Honestly, I think it’s more likely is that Jones is trying to suggest that Luther historically had 100+ total new enrolled students…. in this case, his numbers are incorrect as it relates to their new students for this fall—which, as I noted above, are going to be over 120 new students. Bethel Seminary – Bethel Seminary is a part of Bethel University and is the historic evangelical school in the Twin Cities. Jones is concerned that Bethel has closed their Seminary of the East campuses, laid of faculty, and has taken a conservative turn. He also notes that in its heyday Bethel welcomed over 200 new students every year but is now down to 60. Bethel has declined in enrollment since its peak in 2008. Edit 9/15 based upon commentary from a BSOE professor: I realize that my wording here is too dismissive of the work and ministry and mission of SOE, and for that I apologize. I was hoping to counter Tony regarding the total number of students who are a part of SOE and what that means for Bethel Seminary as a whole. The entire time BSOE was a part of the larger Bethel Seminary community, it was a true gift and I was deeply impacted by some of my colleagues from SOE. Though I believe I’m representing the official narrative re: BSOE correctly in terms of finacials, please see Brian’s comments at the bottom to see his counter to what I present here. In the 2000s, Bethel expanded aggressively, acquiring what became known as Seminary of the East, adding degree programs, and becoming the first Seminary to pursue distance-mediated education through its innovative InMinistry Program. Like many other ATS schools, it has faced challenges since its peak enrollment in the fall of 2008. Some of these changes are due to market realities (lack of credit or realization of the legacy of debt, changes in church life, etc.) and others are due to transitions at the university and seminary (new President, requirement that the seminary become revenue neutral, the fact that Bethel is tied to an undergraduate institution and the decline in enrollment there negatively impacts the seminary). While the exact future vision of Bethel Seminary is unclear at this moment, the vision is in the works (the new VP/Dean has solicited feedback from alumni, students, and other constituents and is building a vision of Bethel as a center for theological leadership). Many of my colleagues who are progressive evangelicals or post-evangelicals have lamented some of the changes at Bethel Seminary and while I might want to fight for Bethel to be as progressive as I’ve become, the reality is that it is an evangelical school of the BGC/Converge and the leadership is being intentional about cultivating the relationship with their denomination and re-focusing on service to the church. It is a time of transition, but their leadership is carving out a future that they feel called to and one that they can sustain in a university setting. Additionally, I would remind us that back in the early 1990s Bethel Seminary was at risk of closing. Through innovation, leadership, and vision it grew from being a regional, BGC-specific seminary to one of the 15 largest seminaries in the nation (and the forerunner in distance-mediated education). With this in mind, I both wish and pray for the best for Bethel into the future. Right now, I’m not sure what that future will be; I don’t know if the seminary will become a part of the graduate school (total conjecture on my part), or if it will hone-in as a resource for Converge Worldwide (the former BGC) and other evangelical leaders…regardless, I wish and pray the best future for Bethel. As for where he gets the number 60? I’m baffled (again). Bethel has historically welcomed more than 200 new students over the course of the year, and while their numbers are down, they are not anywhere near the numbers that Jones suggests. I have no idea what he is counting (note: Bethel’s numbers aren’t yet available because the final count comes in on Friday. I’ve spoken with some folks at Bethel and they don’t know how he arrived at his numbers). What I can say for sure is that there were NEVER 200 new M.Div. students, rather there were more than 200 TOTAL new students (which have ALWAYS included the MFT program…something Jones excludes when he arrives at 60 new students for Bethel! )…so either way you look at it, his numbers are incorrect and misleading. 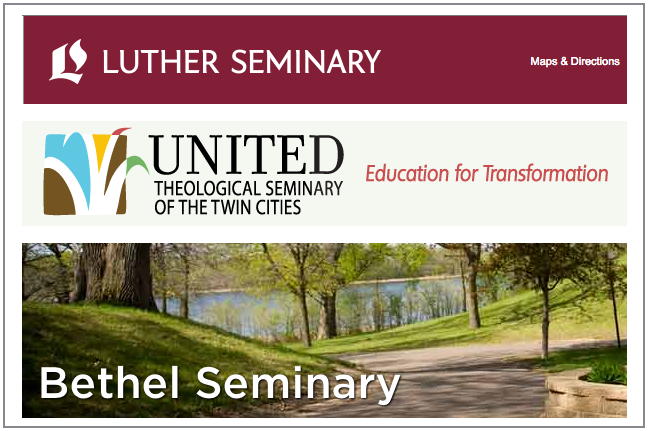 United Seminary- United has historically been the progressive seminary in the Twin Cities. They hired a new president in 2012. As Jones reminds us, this year they brought on board two former Bethel faculty members and one person who used to work at Bethel Seminary. They have started new programs and have increased their enrollment dramatically this fall. They have also begun offering some programming at their warehouse location and have a new bread oven. There is renewed vision, positive energy, and opportunities available through United. Jones is very happy to highlight all of these positives. United has a new location that they are using for programming in the warehouse district. Regarding Scholarships: Thorsten said I misunderstood that the scholarship support came from the endowment, and that the scholarship support has actually come due to donor excitement about the new vision (which is great news!). I was under the impression that this money came out of the endowment based upon prior conversations with Thorsten and the UTS Director of Admissions, Maria French. The point here was that an increase in scholarships and scholarship amounts directly impacts admissions and the ability of students to matriculate. Let me be clear: I’m glad for this increase…just wanted to say that the scholarships impact enrollment increases and declines. Regarding the transfer of Bethel Students: Thorsten said that I mis-represented the increase in enrollment as being due to Bethel connections. Two responses here: 1) I should have been more precise in my language, and for that I apologize. I meant to communicate that there are many people (namely, progressive or post-evangelicals) who with the shift at UTS and the arrival of Thorsten and Kyle Roberts at UTS, and the challenges and changes at Bethel, now find themselves connected to UTS. Even a year ago this wouldn’t have been the case. The point is that UTS has experienced a boost because the progressive and post-evangelicals are finding a new home at UTS and would have historically enrolled at somewhere like Bethel. Their numbers are significant for enrollment numbers and thus I included them. Edits/Commentary from 9/14 I made a change to this sentence because it was overly specific when I wasn’t that specific with the other school, and since my intent is to ensure that both the challenges and opportunities are being lifted up, I’ve changed the wording. There truly is some great stuff going on at United! And if I’m harsh in my critique, it’s only because Jones’ piece AND the narrative I’ve been hearing around the Twin Cities (including from a lot of post-evangelical/progressive Bethel alumni and former staff/faculty) is overly positive about United, ignoring the deep challenges that the institution is facing. They are in serious financial waters…and the President and her leadership team are doing all they can to turn the ship around, but it isn’t going to be easy, and it’s not assured. There is also internal strife about where the school is headed and not everyone is on board for the changes. At the same time, there is also much excitement and hope for the new students and people who are rooting for a great future ahead for United. So here’s what I wish. I wish that Tony Jones would have been more careful…I wish that he could have just uplifted what is great at United, instead of simultaneously putting down the other schools, and misrepresenting them. Can we instead just say that there are great things about all three schools? AND there are some very real and serious challenges too. But one school is not THE place over/against the others. United has historically operated on about a $2-3 million dollar yearly budget (I don’t know their current one) and their enrollment for Fall of 2013 was 127 with a Full-Time Equivelancy of 75.2 (FTE). This fall they are going to start about 60 total new students. Note form 9/14- I didn’t include the UTS endowment because I’m unsure the precise amount. Luther has a $70+ million dollar endowment, a $20-something million dollar budget (I don’t know the exact number for this year) and their enrollment for Fall of 2013 was 695 students with a FTE of 498.9; This year they are going to start over 120 students. Bethel shares an endowment with the University that is about $35 million, a $5+ million dollar budget (last I knew it was $8 million, but I’m not sure the exact number) and their enrollment for Fall of 2013 was about 785 students with a FTE of 327. I don’t know their current budget, nor their current fall enrollment but we can all find that out after they, along with Luther and United, report the data after their “10th Day In” numbers (For Bethel that is this Friday- the “10th Day In” numbers are an industry standard that captures total enrollment, including new students). My fervent hope/desire is that all three schools would be strong into the future. And, this tale would look like (if they were asking me! ), one of a thriving city with three (at least!) Protestant seminaries: The first would have a three-centers approach to training and a focus on formation rooted in the pietistic/evangelical tradition (Bethel); one would be rooted in the intersection of interfaith discourse, liberal and progressive theology, and arts and culture (UTS); and one would train leaders for the church and world who are rooted in the Protestant reformation tradition (Luther). For my part, I will continue to recommend students to all three of these schools (and others!) dependent upon what that student is looking for (I did this when I worked in admissions at Luther and Bethel as well! ); I will try to share honestly about the challenges and promises of each institution as these are both times of promise and risk for everyone involved with theological education. What I will NOT do and what I refuse is this continual celebration of one seminary’s victory at the expense of other schools…this has to cease. Let’s be honest about numbers. Let’s take a long-view of history and engage in critical reflection instead of being provocative. Let’s strive to fight against a scarcity mentality and/or a “winner takes all” perspective…this is not market capitalism (or is it? ), it’s the church. Let’s be irenic and hope for the well-being of the church and theological education in its many forms. And for my part, I will keep praying that all three seminaries and their leadership find positive ways forward as they continue to live out their missions and train leaders for the church and for the world. Thanks, Nate! I hope you are doing well at Hennepin UMC! Well said Sara, while I don’t feel a deep sense of loyalty to my alma mater, I also sense that there is some misplaced vitriol being spewed all around the landscape of theological education as of late. It seems to me that we would all do well to acknowledge that sometimes the traditions that we were raised in do not always contain us well, and when that is the case, it is okay to move on. I can’t imagine anything productive coming of trying to burn the place to the ground on the way out. Perhaps such behavior reveals a bit more going on below the surface that needs to be attended to. Thanks for both truth-telling and inviting a more generous conversation! Thanks, Todd! I hear you. Thanks for this article. One correction (I’m a Luther student): it is incorrect (or at best misleading) to say that “no faculty were let go” at Luther. The financial shortfall did require a reduction in faculty; we got an email back in 2013 saying the plan was that “The faculty will be reduced by about a third over a 2-3 year period.” That’s about what has happened; reduction by a third would take us from 44 faculty members before to around 30 now. Here’s a list of who was slated to leave as of spring 2013; other departures (to the best of my knowledge and hope, all voluntary) have occurred since then. Hi Daniel- Thanks for the note. You know, I’ll make that change and will include your link. I think I was so focused on saying “no- no one got laid off…”because that is true, but you are right, I’m not being fully forthright in excluding that Luther’s Faculty is smaller than it was. Thanks again for your feedback and critique! I’ve been thinking of your comment overnight and reflecting on my own framing of that section and what I was thinking and I realized that this is one of the points where I was responding more to Tony then just stating the picture…his post made it sound like Luther has lost a lot of faculty and is really hurting and in decline. While I feel and witnessed the anxiety, pain, and stress of faculty who made decisions to leave because their futures were uncertain at Luther…in this post I (perhaps overly) wanted to challenge the notion that their absence (or positions not being backfilled) is evidence that Luther is hurting. As I wrote, in 2012 Luther had a student to faculty ratio of 8 to 1…when the AVERAGE of the seminaries of the same size as Luther was 18 to 1. Luther had long been such an amazing resource for the church (the faculty do SO much outside of the classroom to support the church and students! )…but it couldn’t sustain that type of faculty body with the student numbers that are (very close to) what they always had. Donors have been vital in ensuring that Luther could and can remain a rich asset to the church…but in these times Luther just can’t afford to have so many faculty. This reflection/revisiting of why I ended up (unfairly) not addressing that faculty have left Luther all being said- I included your edit and (again) am grateful for your feedback and pushback. Thanks, Daniel. Sara—thanks for responding, and for editing your post. I don’t know if I’m typical, but my sense is that I am/we at Luther are still hurting in a number of ways. I’m grateful for your positivity and love for Luther, and it is quite appropriate to push back against a simplistic sky-is-falling account of the seminary’s present situation. That said, if I were to describe Luther’s present situation, I probably wouldn’t be quite as positive as you are. The loss of all those faculty and staff was a huge hit, and it seems like we’re still getting another email once every few months announcing that yet another faculty member is leaving to take a position elsewhere. The loss of Bøckman Hall, the main dormitory for unmarried students as well as Luther’s iconic building, as a place for students to live is perhaps going to turn out to be the most impactful event of the past couple years for day-to-day student life. Luther is less and less a residential seminary and more and more a commuter and distance-learning seminary, and for me that’s been a disheartening transition: fewer people in chapel, fewer people in the cafeteria, fewer in-person class options (I’m a residential student, and even so two of the four courses I’m taking this semester are online); all in all, less of a stable community from day to day. The vast majority of in-person classes are three-hour blocks, I imagine to make it easier on students who commute in and minimize the number of days they come to campus. Which is good! But one effect is that everyone is on campus less often. All of this was perhaps inevitable, and I’m glad that a Luther education is available to people who aren’t able to live on or near campus, but the new reality still takes some getting used to. I’m just back from internship, so I wasn’t around last year, and it’s not like I have ever been the most social person or had my finger on the pulse of the student body; you should take what I say with a grain of salt. And admittedly, all the things I’ve described above are first-world problems. I’m grateful for your positivity and your prayers, not to mention for your well-informed and accurate explanation of the state of play for Protestant seminaries in the Twin Cities. Hey Daniel- I hear you…my post isn’t intended to ignore that there are real challenges at all of the schools…but to highlight that there are both challenges and opportunities at all three. I have been concerned for the past two years though that sometimes when there are challenges the response can become “the sky is falling in!” For instance, there were many people saying things about Luther in the Fall of 2012 as if it was going to close…and that simply isn’t the case! I know that all three of these schools, and theological education in general, will continue to face uncertain and potentially very challenging times. My hope and prayer is that we can root for and support each other in the midst of whatever will come to be! Sara, great article and perspective on 3 of the 5 seminaries in the area. One note of correction, you stated that Bethel expanded to both coasts in the 2000s, when in fact Bethel San Diego has been around since the 1970’s. Hey Scott! Thanks for the note on a few levels: 1) Thanks in general! 🙂 2) Thanks for reminding us that there are 5 seminaries in the Twin Cities…I tried to be intentional about naming them the “Three Protestant Seminaries”…especially in light of my now being at a Jesuit institution…I don’t want to neglect that we Protestants can learn much from our Catholic friends and colleagues! 3) Thanks for that edit regarding BSSD…my language was sloppy there and I’ll go in and correct it. I hope you are well! Thank you, Sara, for producing this thoughtful, systematic, data-rich reply to a piece that is none of the above. It takes a great deal of work to counter dramatic articles that have simplistic story lines and are careless with the facts. Your specific knowledge about and broad experience in theological education in the Twin Cities (along with your faithful realism about the future of the church and its seminaries) make you the best possible respondent to Jones. I’m grateful that you discerned what your baptismal vocation called for in this specific situation! Thanks so much, Jonathan! You know how much I value theological education…and Luther (along with the other seminaries!). Thanks for your continued investment in Lutheran theological education. Sara, thanks for doing this. It seems like Tony threw a bomb out there, based on anecdotal evidence, then invited people to give him the correct data after he published his post. If he was concerned about having the correct data, he might have wanted to ask for the correct data ahead of time – like you did. Thanks for your leadership and scholarship here. Thanks, Joseph. You and I both deeply know how important those numbers are…and also why it is critical that they are correct! I’m grateful for your leadership while I worked with you at Bethel. Excellent contribution to the discussion, Sara. One question: in regard to the closing of programs at Luther, they also discontinued the Master of Sacred Music program at the same time, did they not? Thanks for the note! I appreciate your feedback and question. Regarding the closing of programs: I only commented on the Ph.D. because I know what is going on with that one and it’s under review and on hold while they figure out if they can find a sustainable model. On that point I was interested in refuted Jones’ notion that there were “multiple programs” that were discontinued. You are right though to bring up the MSM program…I left the MSM out of the conversation because I honestly don’t know its current status (if it’s on hold and will re-emerge as something else, or if it is for sure done). I think with President Steinke now in place they will be evaluating the programs and we’ll have to see what happens. Honestly, your comment is evidence that on this point (and the one regarding faculty!) I was over-responding out of frustration to Jones in my trying to say: “Luther isn’t falling apart and losing programs left and right!” Thanks for your corrective and thoughts, Robert. I appreciate it. Well written. Thorough and precise. Thanks, Joel! I hope you are well. Thanks Sara. It is great to hear your passionate voice in this article. Thanks for the principles and deepening of the conversation. . Thanks, Jon! I hope you are well. You know how much I care about theological education and formation…the church…and HOPE! As a progressive post-fundamentalist evangelical at Bethel Seminary – having began in 2008, but having served 2 elca congregations as well since ’08 i totally agree with what Sara has outlined here. I didn’t have the insider scoop she has, but when i read Tony’s blog i thought, come on dude, you’re better than that. We desperately need all 3 schools in the Twin Cities, and the world. All 3 have important parts to play and they are succeeding and failing to the degree they are supported by the rise or fall of their home bases. Lots of re-imagining to do… Don’t give up. Thanks so much for the note, Katie! I hope you are well. I found this discussion interesting and informative. My comments here involve only a minor issue and don’t take away from the more substantial issues discussed here. I am one of the Bethel Seminary of the East faculty laid off by Bethel this past summer. I have been a part of Seminary of the East since 1987 when it was an independent institution. I was present during its merger with Bethel, a process that culminated in 2002. I respectfully disagree with the statement regarding “The significance of the Seminary of the East closing (it was a few very small campuses of a handful of students that had been unsustainable since it was acquired). It would be more accurate to say that Seminary of the East always operated on a balanced budget up to and during its merger with Bethel, and that it was financially revenue neutral throughout most of its more recent years (meaning that its local expenses usually matched its local income). I personally believe that the management we received from Bethel was not always as helpful as it might have been and that it was closed more for political reasons at Bethel and not financial ones.